​Our orchestras and small ensembles are open to all students who have not yet graduated high school. ​Ensembles are activated when a minimum number of students are enrolled. Students who are interested in joining our program must complete an Application Form to schedule an audition. Open House & Bring a Friend! This semester, YMI will be hosting its Open house on Thursday, November 15th and Sunday, November 18th. Current YMI students are encouraged to “bring a friend” to rehearsal introduce them to our organization. In addition, new students are welcome to come learn about our many ensembles and programs available to them! Parents and student musicians are welcome to learn about the organization in an informational, followed by attending, listening in, or sitting in the rehearsal(s) of their choice! 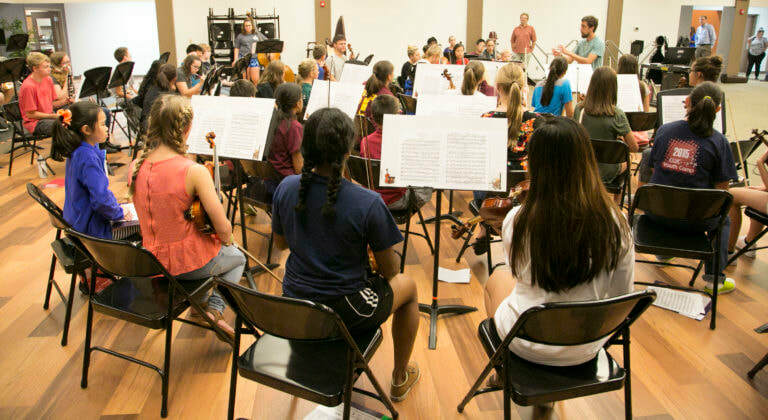 We encourage interested students to attend the rehearsal of their choice, sit in, and even bring their instrument. Guests will meet their peers in the respective orchestras and ensembles, chat with the conductors and learn how being a member of Youth Music Illinois will expand their skills, team building and performance experience. *Interested students are not required to attend the full rehearsal, nor are students required to attend the informational. However, attending both is highly suggested.